Cardiff Bay Historic DocklandLooking for something fun and interesting to do while visiting Cardiff? 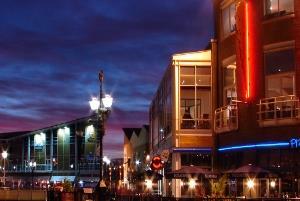 Cardiff Bay has it all to offer! Tiger Bay, now known as Cardiff Bay - Cardiff's dockland district - is Wales' oldest multi-ethnic community. Sailors and workers from over 50 countries settled here. Some of the largest communities included the Somalis, the Yeminis and Greeks. Residents of many races and backgrounds socialised together and intermarried, creating a distinct community. Tiger Bay was also notorious. A slice of red-light district and gambling dens between Cardiff's city centre and its docks, and home to a rich mix of multi-racial communities, it had a powerful character of its own. Its most famous former residents are former rugby star Billy Boston and singer Shirley Bassey, who were both born in Tiger Bay. Today, the Cardiff docklands area is known as Cardiff Bay and it has been transformed by the Cardiff Barrage that impounds the Rivers Taff and the Ely to create a massive fresh-water lake. A number of boat tours operate from Mermaid Quay, which allow you to gain an understanding of the history and fauna of this exciting and upcoming area. There is also a water taxi service which operates throughout the year from the Bay to the city centre and Penarth. Cardiff Bay is home to a number of attractions such as Techniquest Science Discovery Centre - ideal for all the family, Craft in the Bay, The Welsh Assembly at the Pierhead, Butetown History and Arts Centre, Goleulong 2000 Lightship, the Norwegian Church Arts Centre and the Wales Millennium Centre, a stunning international arts centre. The harbour at Cardiff Bay experiences one of the world’s greatest tidal ranges up to 14m. This has meant that at low tide, it has been inaccessible for up to 14 hours a day. The new barrage will eliminate the effect of the tide, which has acted as an inhibitor to development, releasing the potential of the capital city's greatest asset - its waterfront. Looking for something fun and interesting to do while visiting Cardiff? Cardiff Bay has it all to offer! Tiger Bay, now known as Cardiff Bay - Cardiff's dockland district - is Wales' oldest multi-ethnic community. Sailors and workers from over 50 countries settled here. The construction of the barrage is one of the largest engineering projects in Europe. Completed in 1999, it has created a 500 acre freshwater lake with 8 miles of waterfront and it is hoped it will stimulate the future development of the Bay as a tourist and leisure destination.